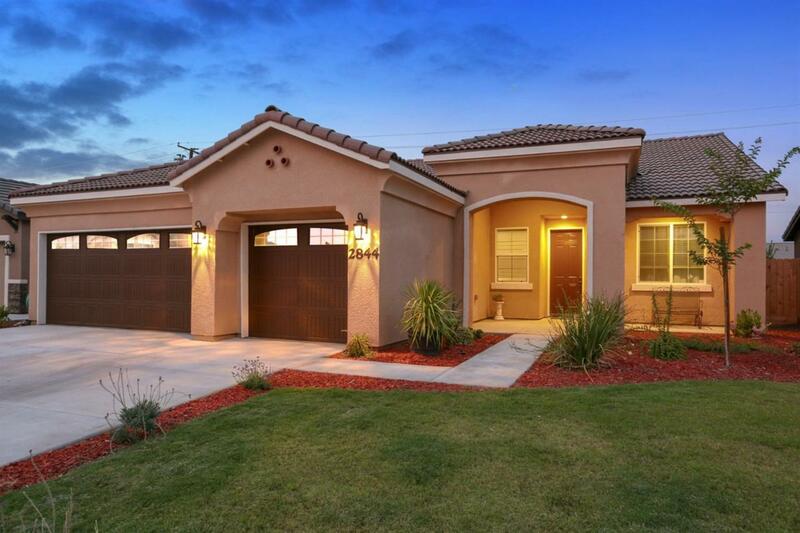 Beautiful nearly new home available in SE Visalia! This wonderful find features a very open and functional floor plan with 4 bedrooms, 3 baths and 3-car garage. You will be impressed by the many upgrades found here, from the flooring to the hardware and plumbing fixtures. The master suite is grand and includes a luxurious master bath with granite counters, a soaking tub, a beautiful tile shower, and a large walk-in closets. The second master suite is the perfect mother-in-law quarters with its own bathroom with a granite counter, tile shower, and walk-in closet. The kitchen features bright white cabinets, gorgeous granite counters, stainless appliances and a convenient center island. Alluring porcelain tile wood floors fill this home in all areas with exception of the bedrooms where you will find upgraded padding and carpet. The backyard is fully landscaped with a patio area and plenty of space to play and entertain. Call for your showing today! Listing provided courtesy of Erik Anderson of Bloom Group, Inc.